You’re One In A Billion! What were you up to on 26 October 2017 at 19:34:37 Malaysia Time? Maybe you were rushing to a movie date, returning home for a meal with your family or on the way to your gym class? Wherever you were, we hope that you were on a Grab ride as you might have been part of something exciting that happened! At that precise timestamp, down to the second, 66 Grab rides started concurrently across all seven countries that we operate in Southeast Asia, helping us cross the one billionth ride milestone! We got curious and looked into the data behind those 66 rides at that precise second. What we have achieved today is only possible because of each and everyone of you, who believed in us. With your continual support and strong commitment of our driver-partners, we believe that we will be able to reach our next billion even quicker. We’re really thankful and to express our gratitude, we contacted our passengers and driver-partners who were part of these 66 rides and thanked them personally. 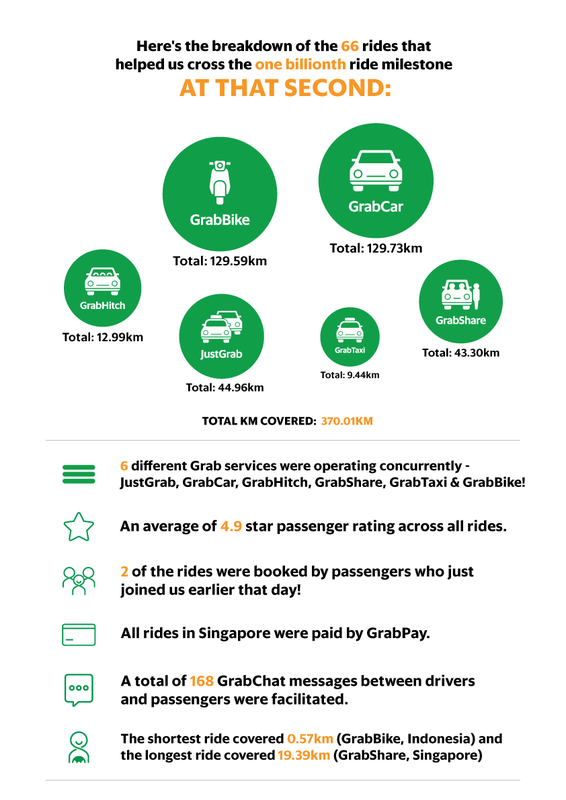 Many were thrilled when we told them that they helped contribute to this amazing feat and started sharing with us more about their journey with Grab. Fun fact: It’s amazing to find out that Erasmus swam competitively for 10 km in the open sea during SEA games, which is equivalent to about half his travel distance via Grab from Singapore Sports School to 313 Somerset! Myo was super proud that his first ride turned out to be part of our one billionth ride count. “It’s extra special to me,” he said. 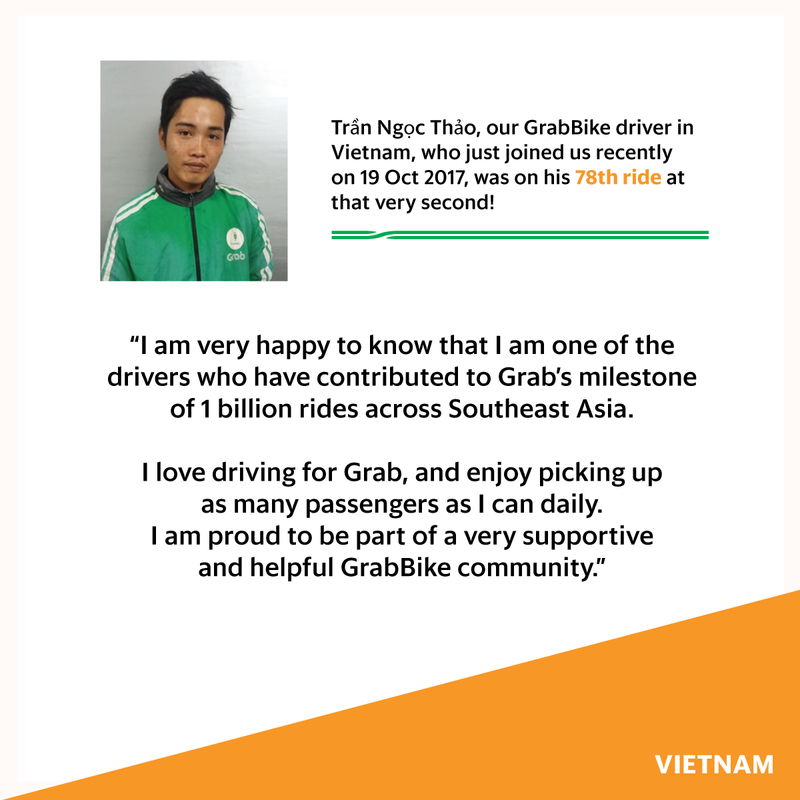 He is happy that Grab helped him to earn a good income, and he has since completed more than 30 Grab rides within his first four days with Grab, which is much higher than before! “I wish Grab the very best and will recommend Grab to my driver friends,” added Myo. We’re really glad to be able to put faces to these Grab rides. All these recounts and testimonials only serve to remind us that Grab makes a positive difference to people’s lives, no matter how big or small it might be. Today, Grab is in 142 cities across 7 countries in Southeast Asia. We have a huge responsibility to fulfill. More than 68 million people depend on us everyday for their commute. 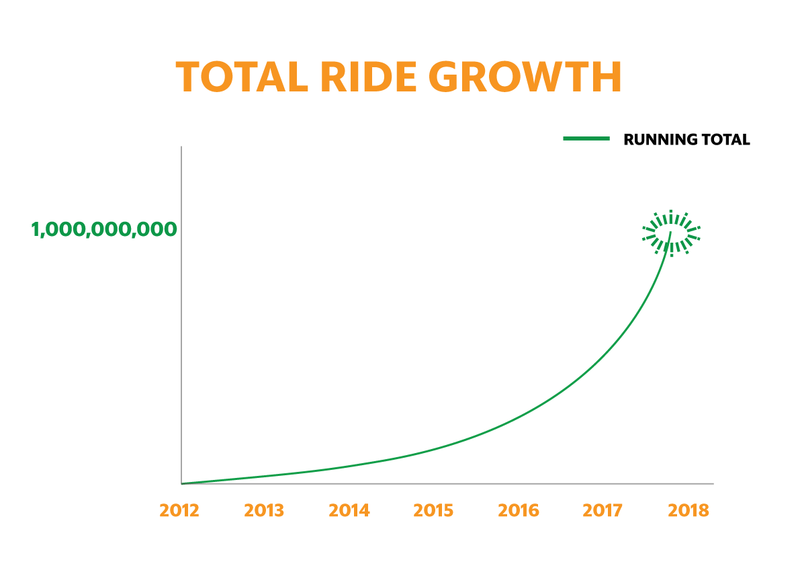 But as we celebrate our one billionth ride milestone, we will always remember why we started in the first place. When Grab started five years ago, our founders had a simple goal in mind to deliver safer rides for people in Southeast Asia. And going even further back to our founders’ days in Harvard – where they first concocted a business plan in 2011, they were only targeting 3,000 drivers at the end of 19 months and 11,550 drivers at the end of the third year. Now, over 2 million driver-partners use our platform and earn up to 55% more than national average hourly wages. One billion. That’s a whole lot of successful connections made between passengers and drivers. Each trip brings our passengers closer to their loved ones and friends, their favourite hangouts, their workplace and things that matter to them. While there are infinite possibilities to how the future will unfold, what do you envision Grab to be like in ten years’ time? Self-driving cars? Connector of land, air and sea transport? Who knows, maybe we’ll make it happen!